Recently, I threw out a bunch of my shoes. I felt good about it at the time. Most of them were old, worn out and, frankly, embarrassing to wear out of the house. (This is not to say that I wore them inside the house, ever. I exclusively wear my cozy, furry L.L. Bean slippers whilst indoors.) I felt that I couldn’t go to work even for one more day feeling badly about the shoes I had on. However, I didn’t think about the fact that I would have to replace the shoes that I threw out until I actually went through with it. And the thing that I hate most in the world is shoe shopping. Haha, I know, what a joke. I’m a girl! Girls love shoes! I do like shoes, actually. They protect my feet and keep them warm sometimes and they can look pretty if you don’t wear them out like I do. I just hate the act of looking for shoes. And that’s because I’m always replacing shoes that I can no longer wear and so I’m always looking for something very particular that never seems to exist in the market when I’d like it to. I also get way too invested in shoes that are too impractical or colorful or expensive when I’m looking which sends me into this spiral of shame for wanting something that I want rather than something I need. If that makes sense. I don’t know if it does. Anyway, I went shoe shopping a few weeks ago with the intention to buy myself a nice, new pair of flats that was both practical and beautiful, in order to begin building up a collection of decent (and spring/summer-appropriate) shoes once again. Here is what happened: I went to Bloomingdales. I was disappointed by their shoe selection. I went to some random shoe store a few doors down from Bloomingdales on Broadway. I very hastily purchased one pair of Minnetonka moccasins, as a “replacement” for an old pair I threw out literally years ago, and one pair of bright red Toms, even though I pronounced many times over the last few years that I would never buy Toms because I thought they were hideous. So I went home with two new pairs of shoes, neither of which was a nice, new pair of flats that was both practical and beautiful. BUT, they were two new pairs of shoes to wear and when I looked at it that way, I felt pretty good! I alternated between the moccasins and Toms for about two weeks and threw my new-ish – from this season – pair of black boots into the mix on colder days. But I felt very jealous of everyone wearing dressier spring shoes to work. Which led me to pulling out an old pair of ballet flats, which I had been planning to throw out because the little bow on the right one had ripped off but somehow had convinced myself that I needed to keep them just in case, out of my closet. I wore these things to work one day and I got so embarrassed about how scuffed up they were that I immediately went on Gilt Groupe and ordered myself new flats in the same neutral color. It took literally FIVE MINUTES. 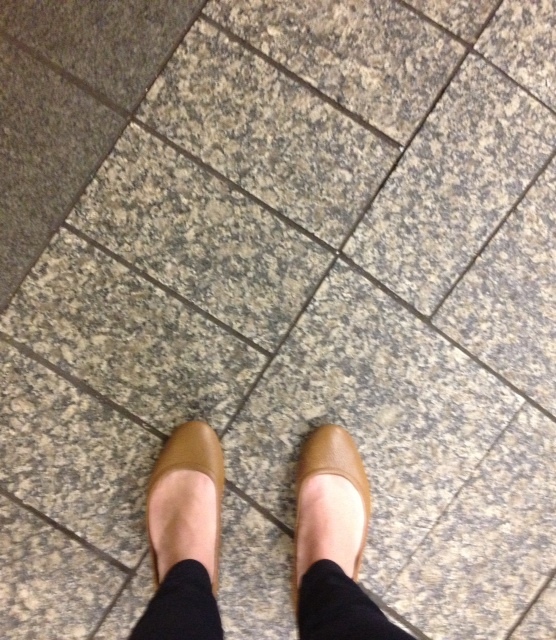 So, shopping for and purchasing these nice, new flats ended up being…easy. It just took one more day of wearing ugly shoes to work to realize that it could be that way. *I feel self-conscious about feet-pictures because of that part in Lost in Translation where Scarlett Johansson talks about taking mediocre pictures of horses and her feet.